Costco (COST - Get Report) celebrated its strong second-quarter results by announcing that it is raising the wage it pays workers for a second time in less than 12 months; the new minimum is $15 an hour. The company announced it was raising its minimum wage to $14 from $13 an hour, in June. Progressive political pressure has placed the acceptable minimum wage target at $15 an hour and fellow grocers have taken heed in recent months. 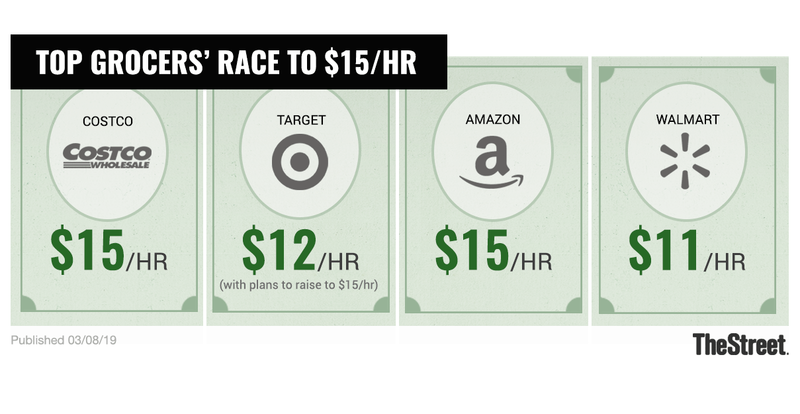 Last year, Amazon (AMZN - Get Report) raised its minimum U.S. wage to $15 an hour. Target (TGT - Get Report) , which currently pays workers a minimum of $12 an hour, has pledged to raise its lowest wage to $15 an hour. Walmart (WMT - Get Report) , the country's largest private employer, raised its minimum wage to $11 per hour last year. The median worker at Costco was paid $38,810 in 2018. That is well ahead of the $19,177 the average Walmart employee was paid and the $28,446 the average Amazon worker was paid, according to the Wall Street Journal. Costco reported second-quarter earnings of $2.01 per share, a 27% year over year increase that easily topped analysts' $1.69 per share expectations. While revenue rose 7.3% to $35.4 billion, Wall Street was looking for revenue of $35.65 billion. Federal employees are currently paid $7.25 per hour, where it has been since July 2009, while federal subcontractors are paid a minimum of $10.20 an hour, according to Paywizard. However, a bill to raise the federal minimum wage to $15 an hour cleared a legislative hurdle on Thursday and is now headed to the floor for a vote by the Democrat controlled legislative body in the coming weeks. Amazon is a key holding in Jim Cramer's Action Alerts PLUS charitable trust.